Exe Estuary Trail NCN Route 2. A long term goal, and well underway is to construct an cycle path around the whole of the Exe Estuary a distance of some 26 miles. From Exmouth on the South Devon Coast, inland across saltmarsh and pasture through sleepy villages towards Exeter, skirting the City outskirts hence down the western bank of the Estuary to Turf Locks along minor roads past Powderham Castle, then largely off road to Starcross and Cockwood, finally on road to Dawlish Warren. The estuary is steeped in history from historic Powderham Castle to the Flemish influenced architecture of the former ship building port of Topsham. The Estuary is a nature lovers delight, internationally designated and a haven for over wintering wildfowl. Exmouth to Lympstone to Exton. 5miles. These largely off-road stretches, the latter of which was only opened in early 2010, are already very popular both with visitors and locals alike. Giving an indication that the route is likely to be one of the most popular Devon Cycle rides. There is even sections supported on a timber boardwalk, sweeping in a gentle curve to the inland side of the railway, offering sweeping views over the estuary. 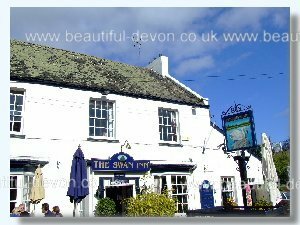 Lympstone village is unspoilt, the Swan Inn offers excellent food and drink. Keen Cyclists or those based in Exmouth will also want to explore another off road section of NCN 2 from Exmouth to Budleigh Salterton along the route of a disused railway line. Within Exeter there is an extensive cycle network. Routes along the river are often flat and off road, the ride from the Quay down to Double Locks, alongside the canal towpath is particularly pleasant, even more so if the prospect of a drink and a meal in very welcoming surroundings appeals to you. Topsham to Turf Lock. Open and largely off road, some along dedicated cycle paths alongside traffic'd roads, from Countess Wear the 3 miles to Turf Locks off road, and along a footpath beside the Ship Canal along the Estuary. In an idyllic location Turf Locks Hotel is a delightful place to stop for a break and a meal. Did you know it is one of the few pubs that can not be accessed directly by car? Walking cycling or boat are the only means to reach Turf. In season a ferry operates from Topsham and there are pleasure trips from the Exeter Canal Basin. Beyond Turf the footpath follows the sea wall to Powderham. The Double Locks Inn shown in the above photograph is accessible by car and also makes a pleasant stop. Powderham to Starcross. Open and on road, offering impressive views of Powderham Castle Deer Park. If you are very lucky witness the sights and sounds of the deer rut in late autumn. Let the train take the strain. There are frequent local train services from Exeter along both banks of the Exe Estuary. Why not catch the train to Exmouth or Dawlish and walk or cycle back? Cycle Hire. Cycles can be hired from Exmouth Cycles, from Saddles and Paddles on Exeter Quay, and from shops in Dawlish Warren. As more off road sections of the Cycle Route open no doubt there will be more hire shops to choose from. Exmouth Cycles is particularly well stocked from adult bike hire to tagalongs to trailers and trikes. N.B. Much of the Exe Estuary Trail is either 'on road' or yet to be constructed. On those stretches already open:- Wear approved safety gear. Ride with care. Coast to Coast Cyclists. Give way to walkers. Be prepared to slow down or stop if necessary. Don't expect to cycle at high or reckless speeds. Be especially careful at junction, bends and entrances. Remember that others may not either see or hear you approaching.